Chairman of the Verkhovna Rada of Ukraine Volodymyr Groysman has spoken about how local elections will be held in the country and noted that the "hybrid" election system, when some MPs are elected via party lists, and some in single-seat constituencies, has been abandoned. "The Verkhovna Rada has adopted a new law on the local elections. 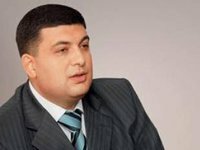 I'd like to explain how the elections will be held on October 25," Groysman wrote on Facebook on Tuesday. According to him, in villages and towns with a population of under 90,000 people, a candidate has to gain over 50% of the votes, which means a run-off could occur. A city or a district is to be divided into constituencies. In every constituency, a party can nominate a candidate. However, election blocs cannot do so as they are unable to participate. If a party scores 5% of the vote, the number of candidates from that party represented in a council will be established in accordance with the number of votes for a deputy in a certain constituency. "Candidates from a party that gained the most support from the voters get in the council instead of those put on the first places in the list by a party," Groysman said. A ballot sheet will contain a candidate's surname and the party that nominated him. "Thus, the votes will be simultaneously given to a candidate and a party," Groysman said. In addition, mayors can be nominated by one party only. "Finally, for those saying that the new law will cause certain constituencies to be left without representative, I answer. Voters have noting to worry about, as deputies will be responsible for the whole city, and Rada will be able to additionally allocate responsibility for constituencies among deputies," Groysman said.